An aluminium canoe paddle with plastic blade, ergonomic handle and handle palm grip pad. 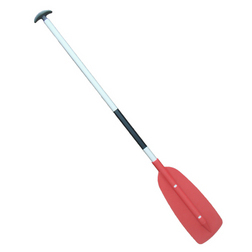 This aluminium and plastic canoe paddle is designed with a dual purpose handle which can also be used as a boat hook, it also features a stream lined, light-weight, paddle blade to help improve the cut through of the water. The boat paddle has an sturdy, ergonomic handle at the top that fits nicely into the palm of your hand and features an additional handle grip pad on the paddle shaft to enhance your hold on the paddle.